Why Upgrade Your Charging System? I can’t keep my battery charged! My current alternator does not keep up with my electrical requirements/load. I don’t want to run my engine just to charge the batteries. I don’t want to run my generator to charge the batteries when my engine is already running. I’ve added several batteries to my house bank, but I don’t think they are being charged effectively. I operate predominantly at idle speed, but my battery bank doesn’t charge at idle. I keep burning out alternators and/or batteries. I have two engines, but my alternators don’t work together to charge the battery bank effectively. My alternator charges my house bank, but I want to charge the engine start battery too without remembering to flip a battery switch. These 6 important steps are fully described below – Read on! Skip this step if you are confident in your house bank’s ability to service your existing vessel loads. Accurate load calculations require precise measurement of your vessel’s equipment. Refer to equipment manuals for actual load ratings or consult with a qualified marine electrician to determine your actual needs. The chart at the right provides typical DC marine loads and an example of load calculations. 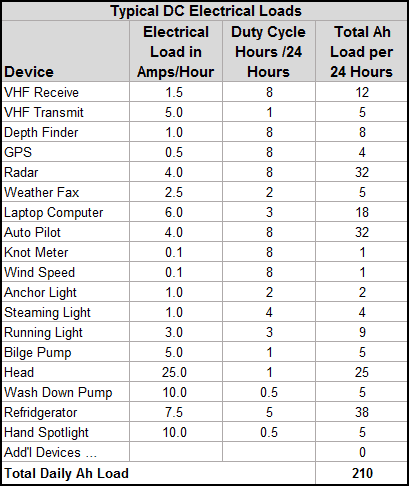 Use this example to configure and calculate your vessel’s electrical load. Click here to upload our interactive Load Calculator and save it for your personal use. You can manipulate the Load Calculator in either Microsoft Excel® or Google Docs®. House battery capacity is typically derived based on the ability to meet approximately 24 hours’ worth of typical demand, but could be longer if you don’t expect to be connected to shore power for extended periods. For example, if your vessel’s typical daily electrical load is 300 Ah, then your battery bank should be sized to provide 300Ah of power storage. Since your batteries will be damaged if you discharge them beyond a 50% State of Charge (SoC%), then 600Ah of rated storage is required. Add batteries to your bank if you need them! Battery bank capacity has a dramatic impact on the size and type of alternator required to keep the batteries healthy. Identify your battery bank technology and capacity, then calculate an acceptance requirement. (A) Standard and Deep Cycle Flooded Batteries can accept a charge load up to 25% of their capacity. (B) Gel Cell Batteries can accept a charge load up to 35% of their capacity. (C) AGM Batteries can accept a charge load up to 40% of their capacity. (D) Lithium Batteries can accept an almost unlimited charge load. Contact your battery manufacturer to confirm their recommended charge loads and profile. For example, a bank of 3 AGM batteries, each with an individual capacity of 100Ah provide a total capacity of 300Ah. With an AGM acceptance rate of up to 40%, a 120A charging alternator could be utilized (300 Ah * 40% = 120 Ah). If you have a really large bank or a battery technology that calls for an alternator output that exceeds available alternator technology, then it will just take longer to charge your bank. Simply choose the highest alternator power which meets your budget and pulley constraints. Now that you know the battery bank technology and charging profile, you can choose an alternator output which will optimally charge your bank. The chart at the bottom of this page shows Balmar’s most popular range of small-case, high-power alternator choices for your vessel, along with an appropriate multi-stage regulator and related temperature sensing cables. (Balmar provides a discount when you buy the package). For 70A – 120A requirements, choose a 6-Series Alternator Package. For 170A requirements, choose an XT-Series Alternator Package. For 220A requirements, choose an AT-Series Alternator Package. Examples of these mounting styles are shown on the right. Review your existing alternator mounting to determine the appropriate mounting for your upgrade. Each Balmar alternator mounting style is identified by a unique part number. Engine drive belt style and width is also a critical factor when selecting a Balmar replacement charging system. Higher output alternators require more drive power to be taken off the engine. All belts have specific limitations regarding the amount of power take-off (“PTO”) loads they can support. Failure to specify an adequate belt/pulley system could result in premature belt wear, belt slippage and potential damage to the alternator and engine. Balmar alternators are shipped with pulleys which are appropriate for the alternator’s output. 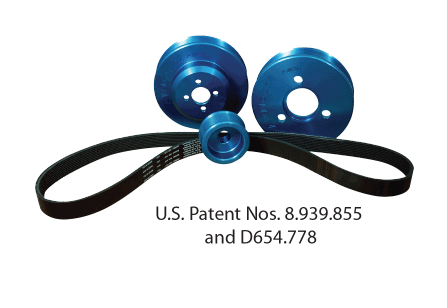 * Note: Balmar’s ½” Deep Vee Pulleys (Single or Dual) can accept a 3/8” and 7/16” belt. Balmar 6-Series Alternators from 70A-100A can perform with a ½” Single Vee pulley. If you need to charge above 100A, then you will need a Dual Vee or K6 Serpentine pulley system to be present on your engine to avoid a pulley upgrade. If a Dual Vee or Serpentine is not present, then an AltMount® Conversion Kit is required. Many boaters choose to limit their charging system upgrade to a 100A 6-Series Alternator Package to avoid the additional purchase of a pulley conversion. Unless you own a recently produced engine which already contains a Dual Vee or Serpentine pulley system, the superior power afforded by the XT-Series and AT-Series Alternator Packages will in most cases require an AltMount® Conversion Kit upgrade. Choose wisely! Need more help? – call Balmar Technical Support to review your existing configuration and needs. With the completion of these 5 steps, you have reviewed all the critical variables required to choose the correct charging system upgrade for your vessel. The chart below identifies common small case configurations of 6-Series and AT-Series charging systems. Use our interactive Charging System Configurator to determine your exact needs. (1) An MC-614 Regulator can be substituted for the ARS-5 when support for a second alternator or twin engines is required. (2) 6-Series Alternators are “Smart-Ready” and can be installed with or without a Balmar Multi-Stage Regulator. Now that you have selected an appropriate Balmar Alternator Kit, complete your purchase by adding a SG200 Battery Monitor and a Belt Buddy Tensioning Kit!